Dr Mark Panton completed his PhD at Birkbeck’s Department of Management where his research focused on the impact of football stadium-led regeneration schemes and the influence that local communities can have on these projects. 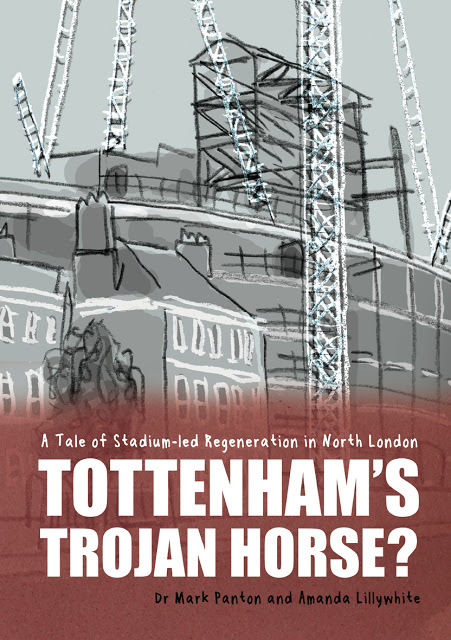 Dr Panton has now turned his PhD thesis into a graphic book about the regeneration plans for the north London district of Tottenham, entitled Tottenham’s Trojan Horse? The book was the subject of a a Birkbeck PhD/Early Career Public Engagement Award. Mark explains the genesis of the project below. My thesis, supervised by Dr Geoff Walters and Professor Helen Lawton Smith, How do Stakeholders Influence Stadium-led Regeneration? (available at: http://bbktheses.da.ulcc.ac.uk/260/ ) focused on the impacts of stadium-led regeneration schemes and the influence that local communities can have on these developments. It focused on developments in East Manchester and Tottenham involving the Premier League football clubs Manchester City FC and Tottenham Hotspur FC. Due to the timing and location, I became particularly aware of the issues effecting individuals and the community in Tottenham. Frequently such individual stories are ignored by those in power and the media; more aware of glitzy photographs or hoardings for the promised developments. In Tottenham these are real people, in danger of losing their homes, their livelihoods and their connections in their community. Through interviews and participant observations from meetings their views were in the thesis, but I felt there would be a benefit in trying to give them a louder voice. My partner is a designer and illustrator. The idea of using a comic-format to develop the Tottenham case study seemed interesting to both of us and we began to discuss the idea of collaborating on a graphic book. I believe that the stories of the people I talked with over a period of 4 years deserved a wider audience than the relatively small numbers of academics that might read the thesis, attend a conference on the subject or read an article in an academic journal. Producing a graphic book would provide an additional way to publicise the work of the many individuals and community groups involved in trying to put forward their own ideas of what their community needed. So, one of the reasons for producing it was to reach a wider audience. It was an important factor that members of the community groups in Tottenham I spoke to were enthusiastic about the idea of the book. They have also assisted with checking details in the book and it will provide opportunities to discuss the issues at future events. In addition to the above, the graphic book offered the opportunity to see regeneration through multiple eyes, reflecting one of the purposes of the original thesis, which was to investigate the views of a range of people about their ability to participate in the developments. The complexities of a real-life case study mean that the book cannot portray all of the nuances, but the medium of visuals plus text does allow for an understanding on different levels than that which is available through the thesis. An impact grant from the Birkbeck School of Business, Economics and Informatics has been instrumental in getting the book off the ground. A lot of work had to be done to edit the 85,000 word thesis into the 54-page graphic book format. A starting point was a timeline of the main events that occurred during the research period in order to develop the story arc and to try to ensure all the main events were caught. I was able to bring it up to date beyond my doctoral thesis. Many of the technical terms related to regeneration were included, with explanatory boxes to make these clear. The aim is to make the book comprehensible for as broad an audience as possible. There will also be a launch event at Housmans on 4 April and Birkbeck students are very welcome to come along. Housmans and a few other bookshops will stock the book and it will be sold online. I will also hopefully be using it as a basis for talks at schools and libraries.